A tribute to the founder of the University of Oxford's Department of Psychiatry. It is with great sadness that the Department has learned of the death of Professor Michael Gelder FRCP FRCPsych FMedSci (1929-2018), an Emeritus Fellow of Merton College, former Subwarden and WA Handley Professor of Psychiatry, and co-author of the Oxford Textbook of Psychiatry. Professor Gelder founded the Department of Psychiatry at the University of Oxford in 1969 and Phil Cowen and John Geddes saw him at home just a couple of weeks ago to record an interview on the founding of the Department. He was in good spirits and very clear and articulate. Professor Gelder’s funeral will be held in the Merton College Chapel at 2:30pm on Monday 23 April, with tea in Hall afterwards. As a young clinical researcher at the Institute of Psychiatry in London in the 1960’s, Michael Gelder was only too aware of the need for better treatments of the ‘neuroses’. Management of these conditions was limited to dependence-producing anxiolytic medications and lengthy psychoanalytic psychotherapies, neither of which were particularly effective. Around this time psychologists had begun to apply learning theory to clinical anxiety disorders which were conceived as a manifestation of faulty learning, or more specifically, the failure to ‘extinguish’ anxiety that was contextually inappropriate or excessive. However, it was not until Gelder’s work that these ideas influenced mainstream psychiatry. Gelder, with his characteristic intellect and scientific rigour developed effective clinical methods to lessen anxiety by ‘desensitisation’, in which gradual exposure to the feared stimulus was coupled with physical relaxation. 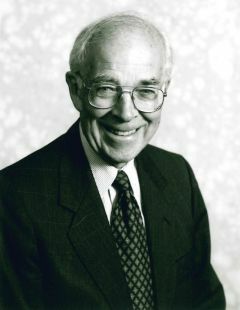 This resulted in his seminal 1966 publication with Isaac Marks, which described the first controlled trial of this form of therapy in patients with severe agoraphobia. A few years later, Gelder’s rapidly growing reputation as someone able to carry out highly original and clinically important research across disciplinary boundaries led him to be recruited to the Foundation Chair in Psychiatry at the University of Oxford. Arriving at the Warneford Hospital in 1969, Gelder’s task was to establish from scratch, and with limited resources, a world class psychiatric research department, as well as organising and conducting undergraduate and postgraduate teaching and sharing in the clinical work of the hospital. Rather unusually for a brilliant researcher and clinician, Gelder also possessed remarkable organisational abilities and committee skills, which he used tirelessly and selflessly to build a thriving Department of Psychiatry, one recognised as a world-leading centre for the development and clinical application of psychological treatments. These goals were formidable but Oxford had chosen well. Early work on agoraphobia used home-based methods to enhance the effectiveness of the behaviour therapy he had developed at the Institute of Psychiatry. Although this was a major advance in the treatment of a disabling condition, Gelder was quick to realise the limitations of a purely behavioural approach and encouraged exploration of the value of adding cognitive strategies, which focus on modifying thoughts, attention and memory. The Oxford Centre that he led was distinguished by an unusually close interplay between psychological theories, experimental studies and clinical innovation - a particularly productive approach. New and highly effective forms of cognitive-behaviour therapy were developed for Panic Disorder, Generalized Anxiety Disorder, Social Anxiety Disorder, Obsessive-Compulsive Disorder, Hypochondriasis, Post-traumatic stress disorder, Chronic Fatigue Syndrome and Bulimia Nervosa. These cognitive-behavioural treatments have been widely adopted in clinical practice, are recommended by the National Institute for Health and Care Excellence, and provide better long-term outcomes than alternative approaches such as antidepressant medication. They have benefitted enormous numbers of people world-wide. Over the years, Gelder attracted to the Oxford Department a veritable Who’s Who of innovators in cognitive behaviour therapy including: Gillian Butler, David Clark, Anke Ehlers, Christopher Fairburn, Melanie Fennell, Ann Hackmann, Keith Hawton, Derek Johnston, Joan Kirk, Andrew Mathews, Paul Salkovskis, Michael Sharpe, John Teasdale, Adrian Wells, and Mark Williams. All benefited from Gelder’s encouragement, his lucidity of thought, his brilliance in grant writing, his openness to new approaches, his strong belief in the value of combining experimental and clinical science, and his commitment to rigorous evaluation of new treatments. In addition to his personal interest in psychological treatments, together with David Grahame-Smith, Nuffield Professor of Clinical Pharmacology, Gelder developed a research unit for the equally new field of Psychopharmacology. This was at the time an almost unique example of cross-departmental collaboration in the Oxford Medical School. The unit’s work on the mechanisms whereby treatments like ECT, anxiolytics and antidepressants actually work has fundamentally shaped our understanding of the biology underlying psychiatric disorder. Michael Gelder was born in 1929 in Ilkley, the only child of Philip Gelder, a wool merchant and Alice Gelder, the daughter of a general practitioner. The family soon moved to Bradford where Gelder attended the local grammar school. Gelder had a long-standing desire to study medicine but his parents discouraged this ambition, arguing that he should join his father in the family business. However, Gelder persisted, taking science A-levels at evening classes and then winning a scholarship to Queen’s College, Oxford where he took first class honours in Physiology. A further scholarship to University College Hospital allowed him to complete his medical training which was followed by National Service as a Medical Officer at the British Army of the Rhine Headquarters from 1956 to 1958. Through his medical training and early clinical work, Gelder became intrigued by the pervasive role of psychological factors in medical practice and this led him to embark upon his training in psychiatry at the Maudsley Hospital during which he won the prestigious Gaskell Gold Medal of the Royal College of Psychiatrists. He then worked as a Medical Research Council Research Fellow at the Institute of Psychiatry. Gelder led the Oxford Department of Psychiatry until his retirement in 1996. He was notable for ‘leading from the front’, attending all Departmental academic meetings as well as carrying a significant clinical and teaching load. His unparalleled clarity of expression and encyclopaedic knowledge made him an inspirational teacher; this was captured particularly in the Oxford Textbook of Psychiatry, which he co-authored with Dennis Gath and Richard Mayou. Translated into six languages, this became the standard textbook for psychiatric trainees. Another of Gelder’s priorities was to foster the talented young clinicians and scientists who strove to join his Department. Many went on to be leaders in the psychiatric and research communities including his successor in the Chair of Psychiatry, Professor Guy Goodwin, Professor David Clark who established the national ‘Improving Access to Psychological Therapies’ (IAPT) programme, Professor David Nutt, the UK’s leading clinical psychopharmacologist and Professor Christopher Fairburn who devised and implemented the current ‘gold standard’ psychological treatments for eating disorders. Trainees encountering the crises which unfortunately but inevitably accompany psychiatric practice would comment on how his acute clinical perception and genuine concern for them helped make such situations bearable and something they could learn from. While Gelder served on major research committees of the Medical Research Council and Wellcome Trust, he had no interest in the personal accumulation of power, and was self-deprecating and modest. Invariably dressed in a grey suit and tie - even when walking his Alsatian dogs - he nevertheless had a formality of manner, which coupled with his intense drive for clinical and scientific excellence and formidable intellect could make him a somewhat forbidding figure. However, patients spoke of his approachability and kindness and the respectful way in which he listened and responded to their difficulties. This side of Gelder’s nature was, of course, well known to his family. His daughter, Fiona remarked that, as a father, ‘he was kind, fair and unfailingly supportive of us all - in school life, marriage and work decisions.’ She is a GP, Colin is a chest physician and Nicola runs her own business. Gelder met his wife, Mandy when he was a medical student at UCH and she was a nurse. Gelder regarded persuading her to marry him as his greatest achievement and he was devoted to her throughout their nearly 64 years of marriage, showering her with flowers on anniversaries and Valentine Days. In retirement Gelder was able to find more time to indulge his love of travel. He had a wide circle of devoted friends who would have been astonished to learn of the trepidation he had been liable to engender in junior colleagues. When he gained an Italian son-in-law, he joined Italian classes and at the wedding gave a speech in both English and fluent Italian. He continued to play real tennis at Merton College where he was a Fellow, until arthritis supervened. He was an affectionate and attentive grandfather to his eight grandchildren, one of whom, to his delight, recently qualified in medicine.